VERY FINE APPEARANCE. 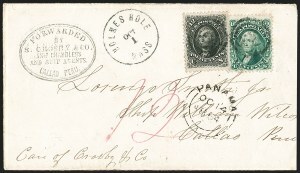 ONE OF ONLY SIX RECORDED INTACT COVERS BEARING THIS RARE SAN FRANCISCO LOCAL POST STAMP, OF WHICH FOUR ARE USED WITH THE 10-CENT 1855 ISSUE. 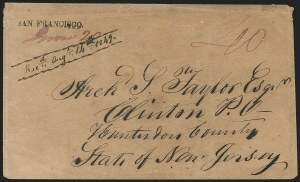 This was carried on the Pacific Mail Steam Ship Company's John L. Stephens which departed San Francisco on July 16, 1855, and arrived in Panama on July 31. It was then carried over the isthmus and put on the USMC Steamer Empire City which departed Aspinwall August 2 and arrived in New York on August 11. VERY FINE. 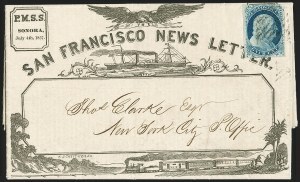 A RARE EXAMPLE OF THE SAN FRANCISCO NEWS LETTER ILLUSTRATED LETTERSHEET. The San Francisco News Letter was published by Frederick Marriott and served to advance his intertwining financial and political interests, to level attacks against his foes, and to extort money from public figures who he threatened with the prospect of scandalous news reports. 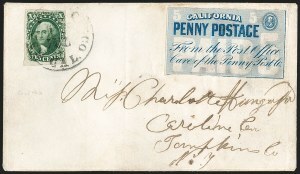 Each publication date was tied to an outbound Pacific Mail Steam Ship Company sailing to Panama and was sold by all Wells, Fargo & Co. agents throughout California. 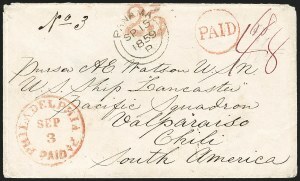 This was carried on the PMSS Golden Age, which departed San Francisco on June 20 and arrived Panama July 4. After transiting across the isthmus it was carried on the USMSC Star of the West, which departed Aspinwall July 4 and arrived New York July 13. EXTREMELY FINE. 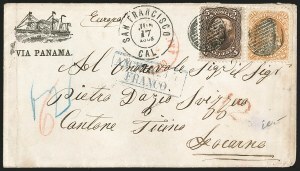 A RARE AND BEAUTIFUL EXAMPLE OF A SINGLE ONE-CENT 1851 ISSUE STAMP USED ON THE ILLUSTRATED SAN FRANCISCO NEWSLETTER. 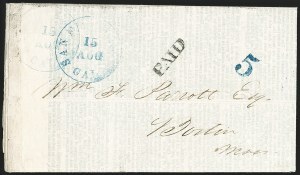 THIS IS THE FINEST OF ONLY THREE RECORDED WITH THE ONE-CENT 1851 ISSUE. 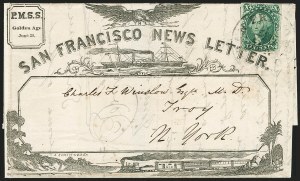 The San Francisco News Letter was published by Frederick Marriott and served to advance his intertwining financial and political interests, to level attacks against his foes, and to extort money from public figures who he threatened with the prospect of scandalous news reports. 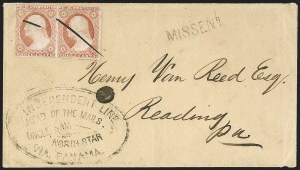 Each publication date was tied to an outbound Pacific Mail Steam Ship Company sailing to Panama and was sold by all Well's, Fargo & Co. agents throughout California. This was carried on the PMSS Sonora, which departed San Francisco on July 4 and arrived Panama July 18. After transiting across the isthmus it was carried on the USMSC Illinois, which departed Aspinwall July 19 and arrived New York July 27. FINE AND EXCEPTIONALLY RARE USE. 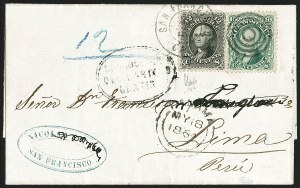 THIS WAS CARRIED PRIVATELY FROM MAZATLAN, MEXICO TO SAN FRANCISCO WHERE IT ENTERED THE MAILS WITH SIX 10-CENT 1857 ISSUE STAMPS TO PAY THE DOUBLE 30-CENT PRUSSIAN CLOSED MAIL RATE TO GERMANY. VERY FINE. 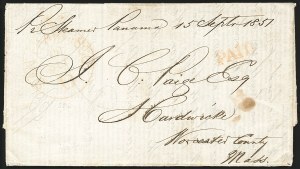 THIS IS THE ONLY EXAMPLE OF THIS "VIA PANAMA" ILLUSTRATED DESIGN WE HAVE ENCOUNTERED. 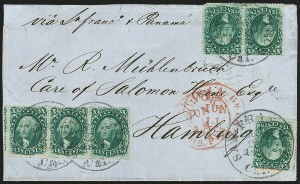 A WONDERFUL 1861 ISSUE TRANSATLANTIC COVER. 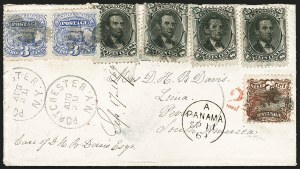 The illustrated "Via Panama" envelopes were published and used mainly from 1858 through 1860. 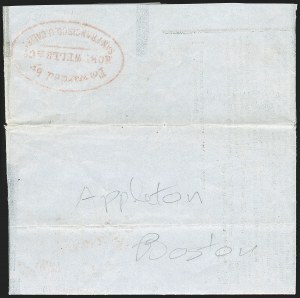 This is the only example of this particular type we have seen or could locate in the Levi records. It is used quite late, but was probably published years earlier. VERY FINE AND STRIKING USE OF A WELLS FARGO & CO. ENTIRE TO COLOMBIA VIA PANAMA AND LIMA, PERU. UNDOUBTEDLY A UNIQUE USE. 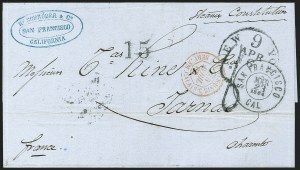 The Panama "De Ultramar" handstamp is very rare and is seldom found used on cover. The interesting route via Lima was likely employed due to the infrequency of southbound ships stopping at Buenaventura from Panama. It was probably deemed faster to catch a northbound coastal ship from Lima that would call at Buenaventura. Ex Campbell. With 2014 Moorhouse certificate. FINE. A RARE AND UNUSUAL ROUTE FROM CALIFORNIA TO NEW SOUTH WALES VIA PANAMA. 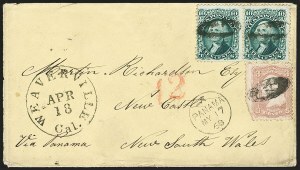 This cover overpaid by 1c the 22c rate to New South Wales by American Packet to Panama, then by British Packet to Australasia (with 12c credited to Great Britain). 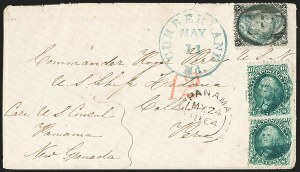 The PMSS Golden Age carried it from San Francisco to Panama on April 20, 1868. It then sailed by British steamer Rakaia from Panama on May 24. 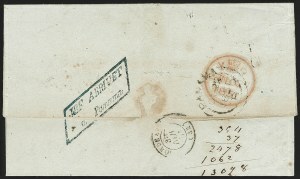 This cover originates from a group of nine covers addressed to Martin Richardson at Newcastle, New South Wales, which came to light in 1981 and were sold through Christie's Robson Lowe in New York. VERY FINE. 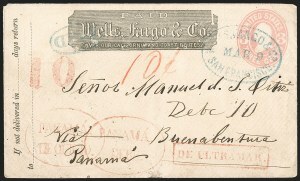 A COLORFUL AND SCARCE FRANKING TO PAY DOUBLE THE 34-CENT RATE BY AMERICAN PACKET TO PANAMA AND THEN TO DESTINATION VIA BRITISH PACKET. This rate was in effect from October 1867 to March 1870. Ex Foote. With 2014 Moorhouse certificate.